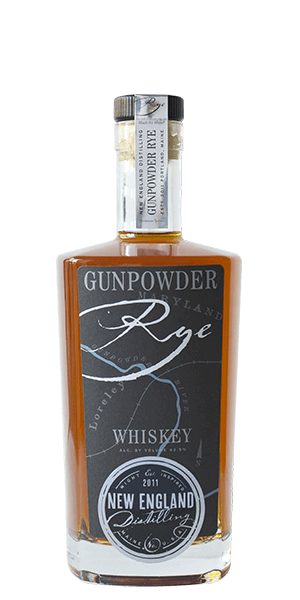 New England Distilling Gunpowder Rye won’t do you any real harm, but the powerfully-rich flavor just might blow your mind. The folks at New England Distilling trace their spirited roots back more than 150 years. Ned Wright—great-great-great-great something of cousin or grandkid or other to the founder of Sherwood Distilling back in the day. But all that don’t mean a thing if it ain’t got a swing… meaning that history is useless unless you make something great with it. Ned is making his family proud with a direct-heat, small-batch copper-pot still located so far East that it’s almost in Europe (actually, Portland Maine). Today, New England Distilling produces three banded spirits: Ingenium Gin, Eight Bells Rum, and Gunpowder Rye. All of them have won awards and each one is worth the price of admission. With the reputation of Rye Whiskey as being Bourbon’s spicier sister and a name like “Gunpowder Rye,” you might think that this Maryland-style Rye would blow your head clean off. But this little sipper is actually named after the Gunpowder River in Maryland. So New England Distilling Gunpowder Rye won’t do you any real harm, but the powerfully-rich flavor just might blow your mind… in all the best ways. This sassy little spirit will grab you by the nose and finish you off on the pallet. And with all that flavor, it stands up to cocktails like a champ. Try it in your next Sazerac Cocktail or even a Boulevardier … you won’t regret it. What does New England Distilling Gunpowder Rye taste like? The Flavor Spiral™ shows the most common flavors that you'll taste in New England Distilling Gunpowder Rye and gives you a chance to have a taste of it before actually tasting it. Is a very smooth drink no aftertaste and a slight bite !